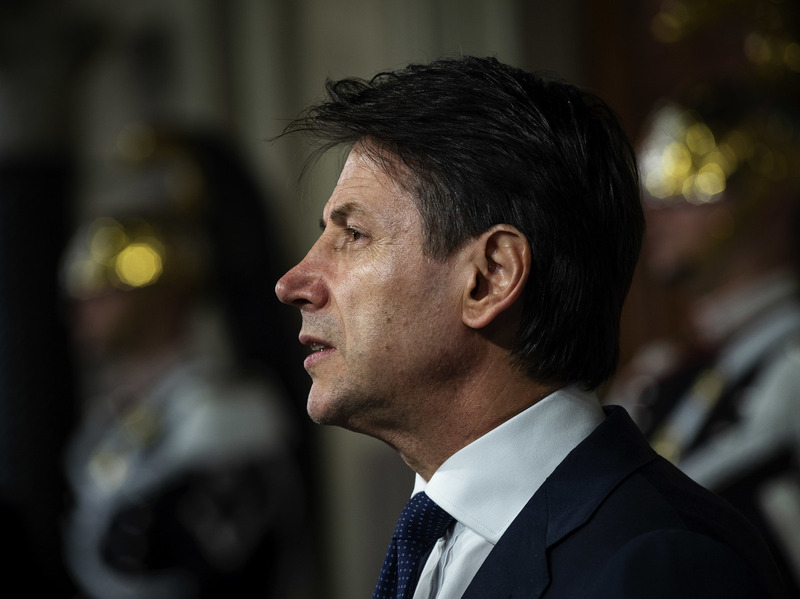 After Months Of Talks, Italy Has A New Coalition Government : The Two-Way The anti-establishment 5-Star Movement and the right-wing League have joined forces — a move that has investors and the European Union on edge over promises for a referendum on the eurozone. Law professor Giuseppe Conte, Italy's new prime minister designate, speaks to the media to present his ministers list after being appointed by Italian President Sergio Mattarella on Thursday in Rome, Italy. In a last-minute shuffle of cabinet posts aimed at appeasing President Sergio Mattarella, Conte remained but an 81-year-old euro-skeptic economist, Paolo Savona, was shunted from the economy minister's post to a European affairs position. The anti-immigrant and anti-European Union League and the maverick 5-Star Movement rode a wave of popular discontent into office. In the past, both parties have called for a referendum to determine if Italy should stay in the Eurozone. Despite their agreement on key points in a broader populist agenda, the two parties spent weeks arguing over who should be prime minister. Under the new agreement, 5-Star leader Luigi Di Maio and the League's Matteo Salvini will be deputy prime ministers. Many analysts have suggested that the two deputies will hold real power, leaving the inexperienced Conte to do their bidding. As NPR's Colin Dwyer reported earlier this week, "Their program, forged from long and, at times, strained negotiations, also includes a mixture of lower taxes and higher spending that has unnerved some European economists wary of ballooning debt." Investors, wary over the political impasse and the possibility that it might force new elections, sent Italian stocks plummeting in recent days. On Tuesday, shares shedded 1.8 percent. According to NPR's Jim Zarroli, "Although the two parties say they are not considering a departure from the eurozone, the mere suggestion of such a move has [also] scared investors. The country represents the third-largest economy in the eurozone and also has substantial debt, much of it held by foreign banks." Even before it is official, the new government had already found itself at odds with the European Union. "In a conference earlier on Thursday, the president of the European Commission, Jean-Claude Juncker, was reported saying that Italians had to work more and fight corruption to improve the situation in the country's impoverished south. ... [Salvini] called Juncker's remarks "shameful and racist." 'The new government will make sure that the rights and the dignity of 60 million Italians will be respected,' Salvini said in a statement, adding that 'Italians expect from Europe cooperation and not insults.'"